The costs of providing health care to an average American family surpassed $25,000 for the first time in 2016 — even as the rate of health cost increases slowed to a record low, a new analysis revealed Tuesday. The $25,826 in health-care costs for a typical family of four covered by a employer-sponsored "preferred provider plan" is $1,155 higher than last year, and triple what it cost to provide health care for the same family in 2001, the first year that Milliman Medical Index analysis was done. 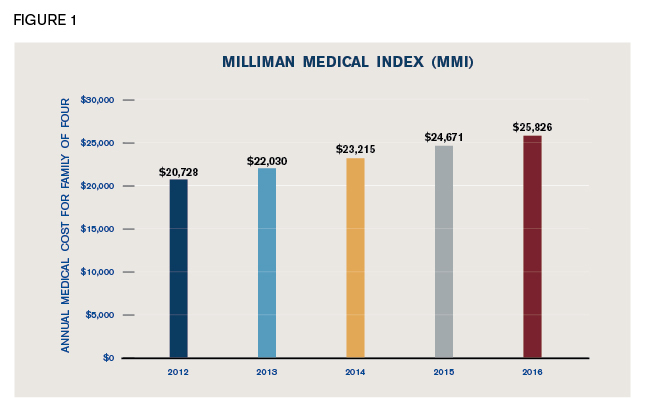 And it's the 11th consecutive year that the total dollar increase in the average family's health-care costs exceeded $1,110, actuarial services firm Milliman noted as it released the index. A significant cost driver identified by the index was the rapid growth in what health plans and insured people are paying for prescription drugs, which now comprise almost 17 percent of the total spending on health care, or an average of $4,270 annually. That's four times the prescription drug costs borne by an average family in 2001, although the index did not factor in the effect of pharmaceutical company rebates, which can reduce the total drug costs and which are becoming more common. The costs detailed by the index include the health insurance premiums paid by both the employer and the employee, as well as the actual expenditures for health care paid by the insurance plan and out of pocket by the insured family. 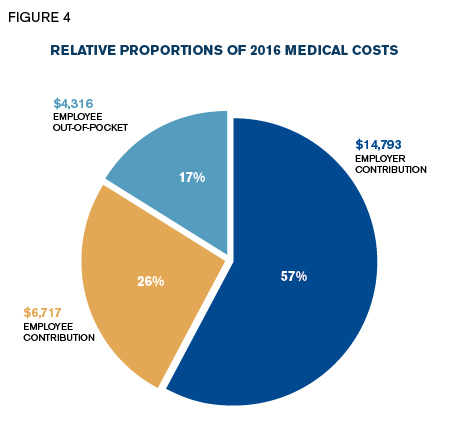 While employers pay 57 percent of the total health costs, that percentage has shrunk from 61 percent in 2001. But the Milliman Medical Index report said that 2016's 4.7 percent increase in health-care costs for an average family of four seen in 2016 marks the lowest rate of increase since the index began in 2001, and only about half the percentage the index has reported in past years. "We seem to be wrestling the curve down to sustainable levels," the index's report said. Still, Chris Girod, co-author of the Milliman Medical Index, called topping the $25,000 mark in health-care costs "a significant and somewhat unsettling milestone." And, as in past years, the index revealed that health-care costs for families insured by employer-based insurance plans were increasing faster than either the rate for overall national medical price increases or the overall consumer price index. The index notes that "many people wonder how costs can be so high, especially if they only visit the doctor for preventative visits and occasional routine care." But the index added that "the disconnect" may be partly due to the fact that about 80 percent of health-care costs come from just 20 percent of the population, whose use of medical services drives up an insurance plan premiums for the others. The $25,000 milestone comes amid the ongoing implementation of the Affordable Care Act, but it is not primarily a consequence of that health-care reform law, popularly known as Obamacare, according to Scott Weltz, another co-author of the index. "We really haven't seen much of an impact here," said Weltz, when asked if Obamacare had any effect on the cost increases identified by the index. Conversely, Weltz said, it's also not clear whether Obamacare played a role in the slowing of the rate of cost increases in the past five years or so that has been observed. The Obama administration has pointed to the overall slowdown in health-cost growth in recent years as a sign of the success of such initiatives. The ACA includes a number of provisions designed to bend the health inflation cost curve, including changing the way Medicare pays for health services, and encouraging doctors and hospitals to form organizations that are paid more based on medical outcomes than on a fee-per-service basis. Employer-sponsored health insurance coverage, the type tracked by the Milliman Medical Index is by far the biggest source of health coverage in the United States. About 155 million employees and their family members are covered through such job-based plans. In comparison, about 77 million people are covered by Medicaid, the government program for primarily poor people. Another 57 million or so are covered by Medicare, the government program for mainly senior citizens. Another 12 million or so people are covered by private, individual health plans sold on government-run Obamacare exchanges. Several million others are covered by individual plans sold outside of the exchanges.